On Saturday 17 December 2011 a very special event took place at the Punjabi Community Centre in Swindon, Wiltshire, United Kingdom. It was a Christmas celebration and carol service organised by the Sri Sathya Sai Service Organisation UK. Nothing so special about that maybe, except that in the past all the SSSSO UK Christmas celebrations have been on a regional basis. 2011 was the first time it was ever held as a national event, and it was a blessing that it just happened to be held in region 7, which covers the area where I live. So, it was with great anticipation that I set off on that Saturday morning and drove the 22 miles or so to Swindon Punjabi Centre. What never fails to amaze me whenever I attend a Sai event is the amount of sheer hard work and organisation that goes into them. Every minute detail is covered, and this event was no exception. Because Christmas is, by and large, a Christian celebration, the organisers enlisted the services of two Christian Ministers to conduct the service AND we were also blessed with a gospel choir who travelled all the way down from Leicester. The event started with some devotees singing songs based on Christian Taize chanting. This was followed by the carol service. There then followed an interval for lunch where we feasted on traditional Western Christmas vegetables and stuffing, washed down with non-alcoholic red and white fizzy wine. Once again I feel I have to mention the tremendous hard work that was put in by the volunteer chefs and food servers in feeding the hungry hoards. During the second part of the proceedings we were treated to the singing of the gospel choir, and the hilarious antics of “Santa” who blessed us by making a surprise appearance. Our wonderful Omnipresent Swami, Sri Sathya Sai Baba made his presence felt throughout the afternoon, and I for one had great difficulty joining in properly with the singing because our Lord constantly filled my heart with his love and my eyes kept filling up with tears. I also feel that I need to mention here the amazing Patrick (of whom I have spoken in a previous post. Please click on the link to view this post https://richardfholmes.wordpress.com/2011/09/10/sri-sathya-sai-baba-never-forgets-his-children-part-one/ ) As usual, speaking to Patrick was a great inspiration, but I was also amazed yet again at what he told me. If you look at the photo of the stage (above) you will notice the white figures. Well, dear Patrick, noted for his stagecraft skills, was asked at short notice if he could come up with something for the event; and he most certainly did. This amazing man made those figures, working late at night and early morning because he also has a day job. With another colleague he set off from Bath very early in the morning whilst most of us were still in dreamland, in order to arrive in good time at The Punjabi Centre so that the stage could be erected. I know that it is not Sai policy to single out individuals for special praise, and this is why I want to end this post by mentioning once again the incredible work that all the organizers and volunteers put into this event. As well as the lovely food we were also kept supplied with as much tea, coffee and soft drinks as we needed and there was also the usual sweets and cakes. The Sri Sathya Sai Book Shop, based in North London, also sent some representatives to set up a makeshift shop. I personally acquired two wonderful photos taken from Swami’s final darshan and a fantastic book of spiritual quotes taken from the religions of the world. Dear friends as we get ready to celebrate this very special time of the year and then welcome in 2012, we should bare in mind that for all of us as individual beings of spirit, our own personal Christmas day will be the day we awaken the Christ Consciousness within ourselves. The Omnipresent ever-loving God does actually answer every single prayer, although it may not be apparent. Thankfully many prayers that go up are answered with a resounding “no”! What then is a prayer? A prayer is a series of thoughts that go out to God in the hope that some kind of result will ensue. Some prayers take the form of a shopping list; sent up as a last resort with the emphasis on “me”. This is generally when God pops up as a kind of afterthought when all else has failed, and these are the prayers that usually get the big “no”! What many don’t realise is that God has to be moved (coaxed) and this happens according to the sincerity of the one engaged in prayer. You see we forget that literally everything is God and God permeates every single cell of matter in this dimension, and indeed semi-matter and light in the dimensions beyond. We already know that our thoughts are creative, everything is driven by thoughts, and this is the same when it comes to prayer. Prayer is communion with God and when we pray from the heart with deep sincerity, not giving a thought for ourselves, then the Omnipresent God is moved into action; things happen. Insincere payers are like blind faith; completely useless. The secret of successful prayer is to detach from the outcome. If you think about this it’s more than logical. When someone complains that God has not answered their prayers, it implies that they were expecting some kind of reward and therefore the prayer was not entirely selfless. To detach is to place everything in the hands of God knowing that he will act in accordance with the Divine plan and our highest good and not necessarily in the way we expect. Now if you’ll just excuse me I’ve got to pray for my Christmas wish list. I’ve been thinking lately how unbelievably lucky I am. Having said that, I’m sure it’s true to say that I’ve earned my luck over many lifetimes, but I can’t help thinking how unbelievably lucky I am that the Divine looks after me in the way that he/she does. Indeed, I am living proof that the phrase ”somebody up there must have been looking down on me” is very apt. In the earlier stages of this life I got myself into some sticky situations because of my naivety and desperation to ”belong” and later as a soldier stationed in Germany my choice of haunts left something to be desired; but miraculously I always seemed to avoid trouble. More recently my ignorance of certain matters has left me in extremely vulnerable situations, but again, I remain unscathed. At the age of 14 I’d got in with the wrong crowd. I’d had very difficult relationships with my parents (for different reasons) and got sucked into friendships simply out of a desire to be accepted and to belong. I didn’t understand back then that to simply be me was the only identity I would ever need and went from living one lie to the other. These friends came and went because they were not true friends, but by the time I was 16 I was hanging out in the West End of London a few nights a week, specifically the soho area. I had been introduced to the area by one of these friends who was a couple of years older than me and much more worldly-wise. I took to hanging out in seedy clubs, sometimes not heading back to North London until after 07.00 a.m. or even later. These clubs were frequented by prostitutes, pimps, drug dealers, thieves and muggers, but somehow I never encountered any serious trouble. Whenever trouble was brewing something always happened that kept me out of danger. By the time I joined the army and got stationed in Dortmund in the then West Germany my only true friend was alcohol. I became like a split personality; on one hand I kept people entertained with my impressions and wit; but that was just a front for my other self, who was quite depressed and withdrawn. I didn’t like the army because of the hypocrisy and I didn’t like the squaddie mentality of wanting to beat people up after a few drinks; I was a happy drunk (when I wasn’t being depressed). I was attracted, for some reason, to the seedy side of Dortmund which was ”under the bridge”. It was a standing joke amongst the lads; and sometimes before descending on ”Der Stadt” we would say to each other ”whatever happens tonight I’m not going under the bridge”. The bridge in question was a railway bridge in Dortmund City Centre. All the nice respectable places were before the bridge, but once you went under the bridge it was a real den of iniquity. The standing joke was that even as we were saying it we knew that after a skin-full of beer we would always end up there. Quite often I would go down town on my own and go to the pubs under the bridge. Looking back it was a very dangerous thing to do; British squaddies, after all, were not the most popular species in Dortmund City Centre. I would go to some real holes on my own, but not once did I ever encounter any trouble. I could relate several more stories from my teenage and army years as examples of being looked after but it would make this post too long, however, in more recent years there are other examples of how I have constantly been protected and I’d like to finish by sharing two of them with you. Both of these examples involve cars. What I know about cars can be written on the back of a postage stamp; to me cars are for driving and nothing else. Sometimes I check my oil and water, but mainly I just drive my cars and hope for the best. I bought a second-hand Toyota in 1999, it was a 1992 model with a genuine 28,000 miles on the clock. I kept the car for nine years and never had one mechanical fault with it. I only cleaned it a handful of times during that period as well because a car, to me, is simply a means of getting from A to B. So, during the time I had the Toyota I only had to deal with natural wear and tear, such as buying new tyres occasionally, new wiper blades, a new battery (once) and just general servicing; renew spark plugs etc. After I’d had the car roughly eight years, someone remarked one day about the good condition that it was apparently in. I explained how long I’d had it and that I’d had no problems with it. Then they said to me ”what about the cam belt”. I didn’t know what the cam belt was and kind of just gave an indifferent reply. Some time later I was having a similar conversation with a friend and she asked the same question about the cam belt, to which I gave a similar reply. When she explained to me that the cam belt is very important and that if it snaps you might as well kiss your car goodbye, I thought that maybe I should look into it. To cut a long story short, the car suddenly started to develop wear and tear problems that were quite major and in the space of a couple on months I had a lot of work done on it that cost a small fortune. But the mechanic who carried out the repairs said he had never seen anything like it. He was a nonreligious/spiritual person but even he said ”someone up there must have been looking down on you”. Apparently you should change your cam belt about every 60,ooo miles. When I eventually got it changed (it was the original belt from new) it had done over 166,000 miles. The mechanic said it was a miracle it didn’t snap. Also the radiator was completely rotten and the brake pads (also the original from new) were apparently right down to the metal. Yet that car started first time every time, even throughout cold winters. The brakes always worked perfectly, I never topped up the water once in the nine years I had it and it always ran like a dream. Eventually, because it had started to cost me so much money I gave it away to the mechanic who had given me such good service over the previous couple of years. The same mechanic sold me my next car, that I’m still driving; although I haven’t had the same good fortune with this one. Well, having said that it would depend on your perspective. It’s not relevant to mention various problems I had with the new car, but an incident in June 2009 is very relevant. At the time I was working part-time on a site that housed adults with learning disabilities. I drove onto the site and down to the unit where I was supposed to be working. Because of the number of cars already taking up spaces I had to park up on a grass verge until staff on the earlier shift had gone home. I went inside the unit and a few minutes later a colleague came in and asked if he could have a word with me. He was quite embarrassed to have to tell me that he had reversed into my car with a works vehicle and put a dent in the front off-side wheel arch. I could see that he felt awful about this, so I just said to him ”don’t worry it’s only a car”. He promised me faithfully he would get it fixed no matter what and we just left it at that. However, when I went to move the car into a proper parking space I was puzzled as to why it wouldn’t move. Another colleague who was standing nearby was looking on and I could see he was trying to tell me something. I got out of the car to find that both of my front wheels were pointing inwards, and my colleague informed me that it looked as though the front tracking rod had snapped. This meant the car was undrivable. It was also very strange because the colleague who reversed into my car was only travelling at about 5 MPH. It soon became apparent to me why my car had been rendered unroadworthy in such strange circumstances. My other colleague pointed out that if the tracking rod snapped at such low impact it must have been ready to go at any time. The realisation then hit me that if it had snapped whilst I was on the motorway or even a major A road, then I would not be in a position to tell the tale. It’s only since Sri Sathya Sai Baba came into my life in 2001 that I have really noticed that I am most definitely protected by the hand of grace. I honestly don’t know why the good Lord protects me in this way; I can only assume that there are plans for me that do not involve me leaving this earthly life just yet. Yes, its great being looked after and I’m so grateful for it. The Divine certainly does have strange ways of protecting his children; but guess what? I’m not complaining. This is a wonderful story I heard just a few days ago. An elderly couple in their eighties, Valerie and Maurice Allen, enlisted the help of a young couple to carry out some work in the rather large garden of their house in Surrey. Valerie and Maurice had come to Swami relatively late in life; they were in their sixties when they first heard of Baba through their son, who had been a principal architect for one of Swami’s Super Speciality Hospitals. But, as we know, age is but a number and has no meaning beyond this realm of illusion. They went 12 times to Puttaparthi, and were blessed with 12 interviews. During one of these interviews Swami manifested a huge diamond ring for Maurice, which he wears all the time. I should also mention at this stage that the elderly couple had a large picture of Swami hanging up in their hallway; this is very significant. When the work was done the two youngsters went on their way, but later that night there was a knock at the door. Maurice answered, leaving the security chain on the door, and found the young couple standing there. The young man said they had a problem with the car radiator and could they have some water. Maurice was a bit suspicious and told the young man that there was a tap around the side of the house and that he should help himself. But the young man said they had no container and asked to borrow a jug. Maurice went and got a jug from the kitchen but when he took the chain off the door to pass it to the young man the couple forced their way in. The young man then wrestled Maurice, who was quite frail, to the floor whilst shouting at his girlfriend ”get the ring, get the ring!” At this point Valerie, thinking some noisy visitors had arrived, came out of the living room to see what all the fuss was about. The young man then turned his attention towards her. He was in the process of lunging at her when he was stopped in his tracks. He stood for at least a full minute staring transfixed at the picture of Swami hanging in the hallway behind where Valerie was standing; it was as though time had stood still. Suddenly, forgetting about the ring, he grabbed his girlfriend and they fled into the night, never to be seen again. This is just one of literally thousands of examples of how Omnipresent Sri Sathya Sai Baba comes to the aid of his children when misfortune comes calling. It’s going to give me great pleasure writing this article because I’m going to tell you a true story about about how Swami bestowed his loving grace onto a truly wonderful man. A man that I have great pleasure in being aquainted with; and a man who was truly deserving of Swami’s grace. For about the last four years I have been attending, whenever possible, the once- a-month bhajan (devotional songs) sessions at the Claverton Hall in Bath with the Bath Sai Baba group. Because I live around 25 miles away it is not always possible for me to attend, and take part in the other activities that the group organise. I am eternally grateful to my wonderful friend and brother, Satyan, for introducing me to this group after I met him for the first time at an event celebrating Swami’s birthday in 2007. However, I digress slightly. Whenever I went along I noticed that a man called Patrick was always in attendance, and I also found that he was always one of the first to arrive to help set up, and always one of the last to leave after clearing away and tidying up. I learned also that Patrick always got involved with the seva (service) activities that the group organised, such as the feeding of the homeless at the hostel in Bath City Centre. I got to know Patrick after a few visits and quickly became aware that he was a man of great humility with the wisdom of a sage, and I also just assumed that he lived in Bath. I also just assumed that he had been to Prashanti Nilayam on a number of occasions. Two things, however, really surprised me. Firstly, when I was chatting to Patrick just prior to my first visit to Swami in 2009, I was amazed to hear that he’d never actually been himself. Secondly, I was equally amazed when someone told me that Patrick does not actually live in Bath; he apparently lives in Bradford-On-Avon, which I believe is at least five miles away. Not only that, he doesn’t drive either; he travels everywhere by pushbike. Nothing too unusual about that, but not only is the Claverton Hall at the top of a very steep hill, but it’s also a very long hill, and I remember one particularly bitterly cold Thursday night in December when the group held a Christmas Carol service at the hall, Patrick had been there then; helping to set up and pack away. It’s difficult to believe that someone would be so devoted to Swami that he would go to those lengths to ”do his bit”. Anyway, that’s the background information, now on to the main point of the story. As I mentioned in a previous article Swami had invited devotees from all over the world to attend a pilgrimage in 2010. The UK had been invited, along with several other countries, to attend in August of that year. Various devotees from Region 7 (of which Bath is a part) were going. Unfortunately, Patrick, being a family man, didn’t have the spare cash to spend on the cost of the flight. However, Baba had other ideas. Because the group booked a bulk ticket the airline offered one free seat for the return journey. So, it was decided that all the names of people who wanted to go but couldn’t were put into a hat. Patrick’s name was amongst them, and lo and behold, his name was drawn. But there was more to come. I saw Patrick some time after and I was telling him how happy I was for him that he was able to go. What he told me next left me nigh on gobsmacked. 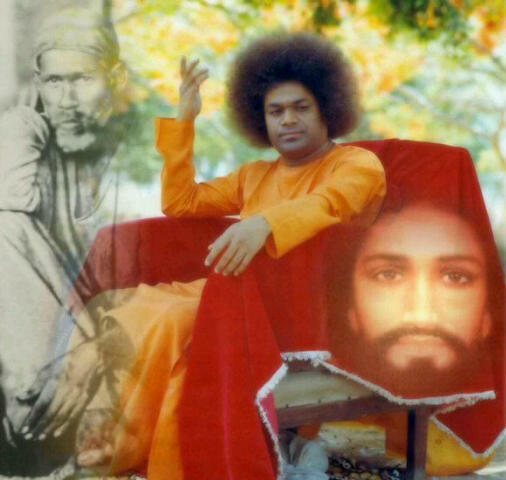 Patrick said that he had been at Prashanti for a number of days and did not even think that he would get any personal attention from Swami, especially on the day in question, because when he was sitting in darshan he was quite a few rows back and never in a million years even dreamed that Baba would single him out. Now anyone who is familiar with Baba will know, that during the last few years in his physical form, he was in a wheelchair. This particular day Patrick was sitting in line with the throngs of people and Swami was being wheeled along in the gangway area specially left clear for his wheelchair (the days when Swami would glide amongst the masses like an orange-robed angel were long since gone). All of a sudden the wheelchair stopped and Baba looked over towards Patrick. As he did so a man sitting a few rows in front sat up obscuring Patrick’s view. Patrick said he quickly moved his head to one side just in time for Swami to make eye contact with him and say ”so you have come at last”. I was overjoyed to hear this and I can just imagine how he felt. 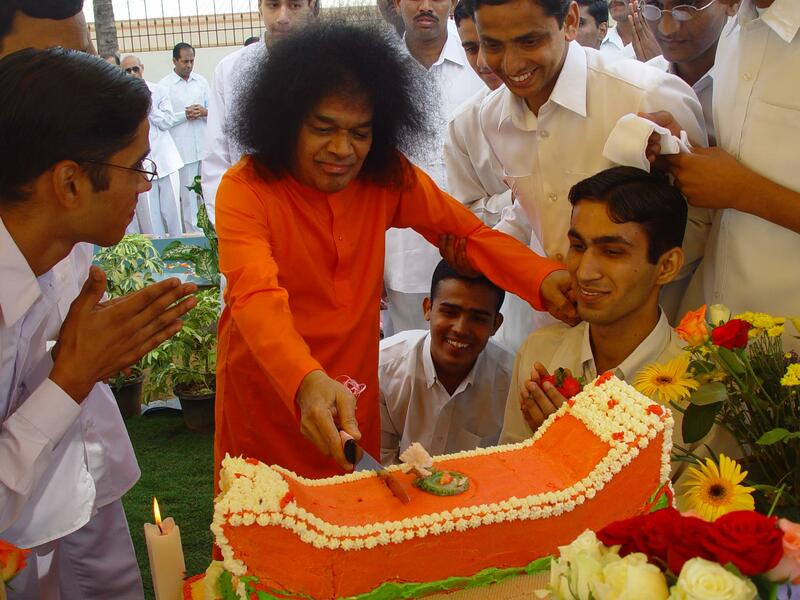 Out of all the thousands and thousands of people in darshan Baba chose to shower his grace on Patrick. I was over the moon for him. I will close by sharing an experience that occurred just six days prior to writing this article. I had not been to the hall for what must have been over six months and I was having an ”inner calling” to attend. I wanted to get there at 13:45 in order to take part in the study group prior to bhajans. But due to circumstances I wasn’t able to get there until the bhajans were about half-way through. As I entered I noticed empty seats at the front where Patrick was sitting. I sat down and we acknowledged each other. Within seconds of sitting down Swami enfolded me in his Omnipresence and I felt my heart bursting with love; my eyes just filled up with tears of joy. It was as though my loving Father was welcoming me home. When the bhajans were over I was able to have a brief conversation with Patrick. As ever I found a few minutes in his company so uplifting and inspirational. It was like a double whammy for me. Baba showering me in his love, and words of wisdom from Patrick; a truly perfect afternoon. It’s now seven days since Swami left his body and the dust appears to be settling. It is apparent, however, that Baba is not conspicuous by his absence, rather the opposite. He is just as present as ever, if not more so, it’s just that he is no longer identifiable by his beautiful physical form; and beautiful it most certainly was. I’ll never forget the first time I saw him close up. He was (and is) actually beautiful. I wrote in my book “Astral Travelling, The Avatar and Me” that I never ever dreamed in a million years that I would end up describing a man as beautiful. But Swami was definitely not of this world and his form was most exquisitely beautiful. Like other devotees I have spoken to I am more determined than ever to carry out Swami’s will in the aftermath of his physical demise. But I feel a pull in a different direction. I feel alienated from the Sai Baba groups, as though my time is done there and pastures new beckon. It’s actually quite exciting, with all the changes happening around the planet and the consciousness of the human race rising as I type. For me there was one particular thing that disappointed me over the last week or so. In the UK there was hardly any media coverage (which is not a bad thing) but what little coverage there was just HAD to mention all the negative stuff that’s been circulated about Swami over the years. They just couldn’t resist it could they. They just had to slip into the story all the horrendous and unfounded allegations levied against a wonderful soul who gave so much and took nothing in return. Friends circulated some photos via email of Baba’s last darshan on March 25th. He looked so frail and ill…..but what was he doing…..blessing the masses, that’s what. He knew he was leaving but he was still giving. I find it so tragic and sad that the media have never been able to see this. It’s such a shame that in an industry that supposedly prides itself on reporting news in a truthful and factual way, they choose to compromise their principles for the sake of a tacky story. Baba lives! He is more omnipresent than ever.